Love, a keen sense of humor and enthusiasm for life, combined with above-average perceptive skills and his close relationship with God, get Paul through the difficulties of his condition and help him deal with society's attitudes towards persons with disabilities. Born in 1964 with cerebral palsy and a unique form of Asperger's syndrome, Paul has never been highly motivated to "be normal." He chooses to live his life as he is—with a lot of joy and acceptance of his disability. He conforms to society's norms where he wants, but doesn't conform where he wants to keep his unique personality intact. "I'm Paul," he says and accepts that others' attitudes might be mistaken about his intelligence—at least until they get to know him better. He loves to talk; he likes to be liked; he likes to get his way— he isn't beyond a little charming manipulation. And yes, he gets angry and frustrated, too. Paul's World, Trying to fit in with disabilities, as told by his mother in collaboration with Paul, will inspire you and your friends—with or without disabilities. Paul and his mother hope the book will help to effect a change in society's attitudes toward the disabled. An unexpected consequence of the book has been the many readers who say Paul's World made them appreciate more deeply the blessings they've taken for granted over the years. We had a great time at the Barnes & Noble book signing event on March 19th. Paul and I talked about the book, answered questions, and then signed books. Take a look at some pictures of the event. 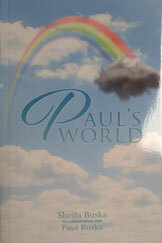 BE SURE TO READ "THE CALIFORNIAN" FOR AN ARTICLE ABOUT PAUL'S WORLD. Paul and Sheila were recently interviewed by Editor Albert Fulcher - a fun and interesting hour! Professor Mendy McClure, after reading PAUL'S WORLD, has added it to the list of reading resources for her SDSU "Disability and Society" class students. I recently attended one of her classes - of 400 students! - and participated in "The Orange Game." She is an impressive instructor. Her students were also impressive: they were absorbed in the class activities and presentations - all 400 of them. Much good will be done for our society by Professor McClure's dedication to teaching.